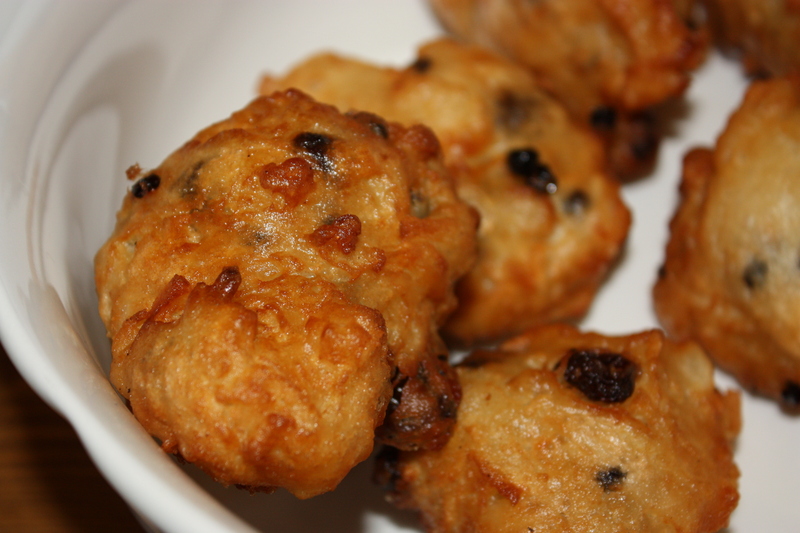 Oliebollen is sort of a donut, but not quite, containing raisons, apples, currents, and other dried fruit. It is a treat served only on New Year’s Eve. Not everyone makes it because it requires a deep fryer so when you are at New Year’s party where someone brings or makes oliebollen, my Dutch friends get excited. Ron is the oliebollen maker in their family. He plans to pass on the recipe and technique to his kids. Even when they aren’t together for New Year’s Eve, Ron and Monique may drop off oliebollen for their son and daughter. I have never made oliebollen before, so cooking them with Ron was a first. The starter dough is familiar, similar to bread recipes I’ve made. Making oliebollen is quite simple, but it requires patience. 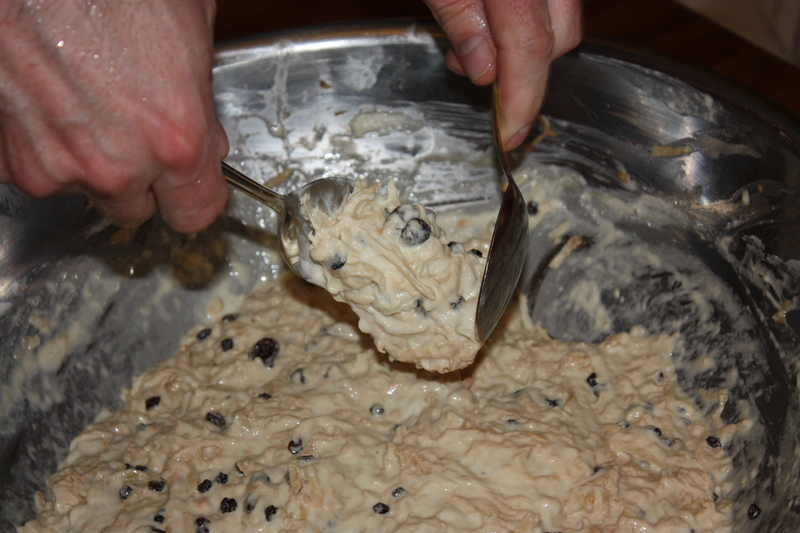 After the initial mixing, we have to wait for the dough to rise properly.When it is finally ready, Ron says it is best to do the final mixing by hand, turning in the apples, raisons and currents. 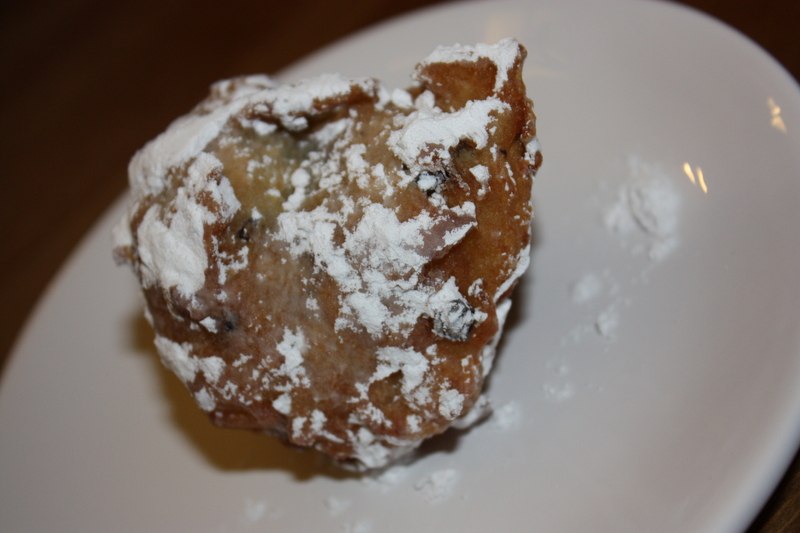 Unless it is unbearably cold outside—as it sometimes can be on a Canadian Prairie winter night—most oliebollen makers recommend deep frying outside. It will smell up your kitchen for days otherwise. Thankfully for our cooking session, it was a sunny, almost spring-like day and Ron had the deep frying set up on the barbeque just outside on the porch. The oliebollen dropped with a sizzle and we watched them brown slowly. When they are done they look imperfectly, perfect. It’s hard to wait for them to cool before eating them. It is best eaten fresh and hot (but not too hot) because it will be crispy on the outside and soft on the inside. The best parts are the crispier tails and feet. When they have cooled slightly, roll or dust them with icing sugar and enjoy a Dutch New Year’s Eve. Dissolve yeast in warm water and let stand for 5 to 10 minutes until foamy. Mix flour, salt, and milk with wooden spoon. 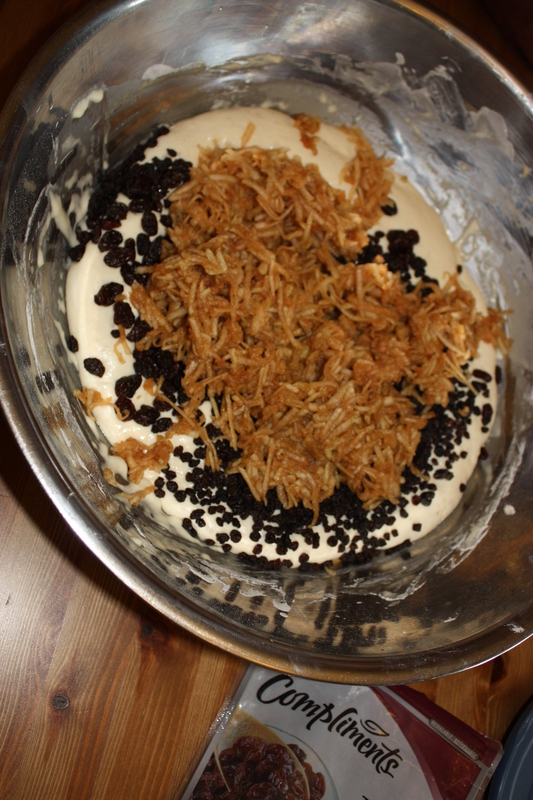 Mix in activated yeast until smooth. Let rest, covered, in a warm dry place for at least 1 ½ hours. Peel and grate or dice apples. Punch down the dough. Fold in apples, raisons, and currents with hands until just mixed. Don’t over mix. Heat deep fryer. Cooking this outside will prevent smelling up your kitchen. 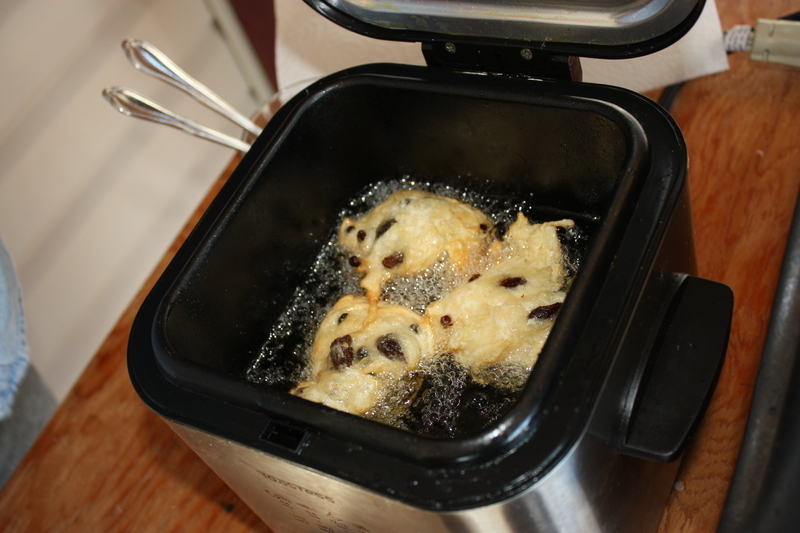 Shape the dough using two spoons and drop into deep fryer. Wait until the dough turns a caramel colour. Turn each oliebollen once. They will cook more quickly as the oil continues to heat up. Place the cooked balls in a bowl lined with paper towel to absorb grease. Allow to cool slightly because they are extremely hot when just out of the deep fryer. Roll in a bowl of powdered icing sugar, or sprinkle with sugar.